Okay, funny story. I had my back turned when Jake first tried these. The noise he emitted scared me. I turned around, very worried, and asked if he was okay. His eyes were shining and he had an ethereal look on his face. Then he cried. No, I'm kidding. But he did say these were it--I mean IT! His favorite! 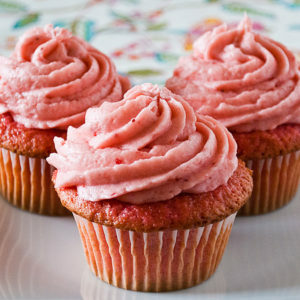 **I'm not a huge fan of strawberry as the original recipe called for so I did raspberry. I'd do it again just to see Jake's face. In the bowl of a stand mixer, beat together the cake mix, gelatin, oil, 1/2 cup of the strawberries, and water until combined. Then beat in the eggs 1 at a time until well incorporated. Fill cupcake liners 2/3 of the way full with batter, do not over fill. If you have extra batter then make a couple more cupcakes because if you over fill the liners the cupcakes will spill over the edges and you will have more of a flat top cupcake. Bake at 350 for about 16 minutes until a toothpick inserted into the center of a cupcake comes out clean. Allow to cool. Place the 2/3 cup of strawberries into a blender and puree. Place the butter in a bowl and using a mixer beat until smooth. Add half the powdered sugar to the butter and beat until all combined and fluffy. Then beat in the strawberry puree until well blended. Beat in the remaining powdered sugar until combined and fluffy. Pipe frosting onto cooled cupcakes.